What's Included In The Box? The Garmin Nuvi 2797LMT Newly Overhauled ships with the following items included. Garmin Nuvi 2797LMT Newly Overhauled. Lifetime traffic receiver/vehicle power cable. Garmin Nuvi 7 Inch Powered Cradle. Detailed Maps with Free Updates. Nüvi 2797LMT arrives with a bright 7.0 display and loaded with detailed maps of North America. With free lifetime¹ map updates, your routes are sure to reflect the most up-to-date maps, POIs (points of interest) and navigation information. With so much data, nüvi 2797LMT makes it easy to find addresses and millions of POIs such as businesses, stores, restaurants and other destinations. Nüvi 2797LMT arrives preloaded with POIs, so theres no need for you to enter that address information. Just select one or many and navigate there, quickly and easily. You also have the ability to add custom POIs to your nüvi 2797LMT. 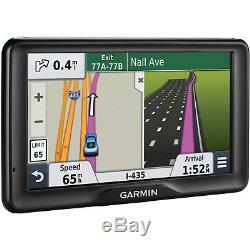 Nüvi 2797LMT features Garmin Traffic to help you spend more time on the move. With Garmin Traffic, your driving map remains onscreen at all times. Traffic alerts appear to the side of your map and messages are spoken, too. Garmin Traffic can give details about the situation, such as how many minutes of delay to expect and if there are any possible detours. It can even confirm whether or not you are on the fastest route. Garmin Traffic is voice activated, so it responds to spoken requests. Lifetime traffic² entitles your nüvi 2797LMT to receive free traffic information for its entire useful life. The Power of Your Voice. Nüvi 2797LMT has the luxury of voice-activated navigation. Speak, and your device intelligently responds your hands can remain safely on the wheel. Of course, you can also navigate using the touchscreen interface. Sync a Bluetooth-enabled device, such as your smartphone, to nüvi 2797LMT for hands-free calling through its integrated microphone and speaker. Smartphone Link is a free mobile app that connects your nüvi 2797LMT with your Android smartphone. When paired, your nüvi 2797LMT can use your phones existing data plan³ to share information such as where you parked, POIs and your destination. Smartphone Link also gives you access to Garmin Live Services, useful real-time information such as weather and traffic conditions. Garmin Live Services are available free and by subscription. Garmin Real Directions with Garmin Real Voice. Nüvi 2797LMT redefines spoken turn-by-turn directions with Garmin Real Directions, easy-to-understand driving directions that guide like a friend, using recognizable landmarks, buildings and traffic lights. No more stress from trying to read street names. Garmin Real Voice is refined speech technology that sounds more like a natural, friendly voice. Garmin Real Directions and Garmin Real Voice are features that are only available in our line of GPS navigators. Comprehensive Driving Guidance You See and Hear. Active Lane Guidance with voice prompts prepares you to drive through an exit or interchange with confidence. As you approach, an animated model uses brightly colored arrows to indicate the proper lane needed for your route a friendly voice offers additional help. Birds Eye junction view offers a detailed view of interchanges, looking down as if from overhead. PhotoReal junction view realistically displays junctions and interchanges along your route, including the surrounding landscape. Brightly colored arrows indicate the proper lane to drive. Nüvi 2797LMT also depicts real road signs as they appear along your route. More Information at a Glance. Nüvi 2797LMT keeps your driving map onscreen at all times and additional information appears alongside. For details, simply ask or touch the screen. As you drive your route, Up Ahead constantly informs you of nearby services, including restaurants, fuel stations, hospitals and stores. Nüvi 2797LMT displays speed limit, current speed and accurate time of arrival. With a quick glance, you can read the name of your current street. Nüvi 2797LMT also shows school zone warnings. A products useful life means the period during which the product (a) has sufficient memory capacity and other required technical capabilities to utilize current map data and (b) is capable of operating as intended without major repairs. A product will be deemed to be out of service and its useful life to be ended if no updates have been downloaded for such product for a period of 24 months or more. If neither of the measures in (a) or (b) can be used to address your products lack of sufficient remaining memory, then Garmin may conclude that the useful life of your product has expired. Garmin may terminate your nüMaps Lifetime subscription at any time if you violate any of the terms of this agreement or your subscription. Your nüMaps Lifetime subscription may not be transferred to another Garmin product. ²FREE lifetime traffic updates may not be transferred to another person or another Garmin product. Lifetime traffic extends for the useful life of your Garmin traffic receiver (as long as you own a compatible Garmin GPS) or as long as Garmin receives traffic data from its traffic supplier, whichever is shorter. A traffic receivers useful life means the period during which the receiver (a) has the required technical capabilities to utilize current traffic data service and (b) is capable of operating as intended without major repairs. Traffic content not available for all areas. ³Users data plan charges, if any, will apply. Contact your mobile service provider for more information about your service plans data and roaming rates. Physical & Performance Unit dimensions, WxHxD 7.4W x 4.5H x 0.9D (18.7 x 11.4 x 2.3 cm) Display size, WxH 6.1"W x 3.4"H (15.4 x 8.6 cm); 7 diag (17.8 cm) Display resolution, WxH 800 x 480 pixels Display type Color TFT with white backlight Weight 8.9 ounces (252 g) Battery rechargeable lithium-ion Battery life up to 2.5 hours High-sensitivity receiver Maps and Memory Preloaded street maps includes lifetime map updates nüMaps Guarantee Built-in memory internal solid state Accepts data cards microSD card (not included) Waypoints/favorites/locations 1000 Routes 100 Features and Benefits Drive stress-free. Turn right in 500 ft. (internal speaker) Speaks street names e.
Turn right ON ELM STREET in 500 ft. Bluetooth® wireless technology Speed limit indicator displays speed limit for most major roads in the U. (find closest hospitals, police & gas stations, nearest address & intersection) Exit services (tells you approaching services on highway) Custom POis (ability to add additional points of interest) Enjoy the drive and customize. Garmin Garage vehicles compatible (download car-shaped icons to your device) Garmin Garage voices compatible (download custom voices to your device) Additional Trip Planner Trip Log Receive live services via your compatible Android smartphone with Smartphone Link. Software update may be required. This USB mass storage device is compatible with Windows® XP or newer and Mac® OS X 10.4 or later. 7.4W x 4.5H x 0.9D inches (18.7 x 11.4 x 2.3 cm). 6.1W x 3.4H inches (15.4 x 8.6 cm); 7 inch diag (17.8 cm). WQVGA color TFT with white backlight. 8.9 ounces (252.0 g). Bluechart g2 Vision Map Compatible. Receive live services via your compatible Android smartphone with Smartphone Link. Garmin Connect compatible (online community where you analyze, categorize and share data). Speech recognition (navigate with voice commands). Automatic routing (turn by turn routing on roads). Auto sort multiple destinations (provides most direct route). Auto re-route (fast off-route and detour recalculation). Choice of route setup (faster time, shorter distance, off road). Route avoidance avoid highways, tolls etc. XM® Navtraffic (includes basic weather) & Radio for U. Feature (find closest hospitals, police & gas stations, nearest address & intersection). Car locator feature (marks position when removed from windshield mount). Configurable vehicle icons (select car-shaped icons for map navigation). World travel clock, currency & measurement converter, calculator. Qwerty or ABC keyboard (choose keyboard layout). Data Services with Bluetooth Technology. TrafficTrends (calculates routes from predicted traffic flow). MyTrends (predicts routes from user's navigation behavior). Services (accurate real-time travel data). Multimode (switches modes to drive, hike, bike or boat). Garmin Garage vehicles compatible (download car icons). Garmin Garage voices compatible (download custom voices). The item "Garmin Nuvi 2797LMT 7 Auto GPS with Lifetime NA Map and Traffic Updates" is in sale since Thursday, April 19, 2018. This item is in the category "Consumer Electronics\Vehicle Electronics & GPS\GPS Units". The seller is "gpscity" and is located in Las Vegas, Nevada. This item can be shipped worldwide.